It was one of only 413 images from over 7,000 submitted eligible to appear permanently on The ARCHIVE – AI-AP’s exclusive online juried collection. Watch me draw and paint really fast! I was invited to be the Artist-In-Residence this year for AC Moore Elementary. This includes a fun commission to create two 40+ feet murals for their school library. Each grade developed an idea for a character and I worked them into the overall design. There are also family of Bobcats (school mascot) hiding in the mural for the kids to find. I drew all the pictures by hand, scanned them, collaged them on the computer and redrew each mural using a Cintiq tablet. Color was added digitally. The final art will be printed and mounted on the library walls above the book shelves. In addition, we will be making stand alone cut outs of the different animals that will go around the school. Here are some images from the mural in progress. We hope to install and have an opening reception in December. Click on each image below. The Richland Library Project was selected as a runner-up for Creative Quarterly Magazine's illustration competition. My work for the Richland Library Doodle Freely Mural was selected to appear in the upcoming American Illustration 37 annual award hardcover book. From over 8,000 submissions, the jury selected, by a majority vote or better, only 367 images to appear in the book and represent the best illustrations from 2017. The American Illustration 37 winning collection will be presented in print and digital media for maximum visibility. There will be an event for the winner sin New York in November. Count me in! One of the most exciting projects I have worked on was the Richland Library Bookmark Wall located in the newly renovated main branch on Assembly Street on the Garden level. The wall contains almost 2000 hand drawn bookmarks. Half were created by myself while the other half was produced by the community including library patrons and several local schools. The hand drawn bookmarks were collected and scanned by my team of USC design student interns. We assembled them into a 53 x 9 foot collage. Digital color was added and printed on vinyl. The project took over a year to complete start to finish but was worth it. Stop by and check it out. 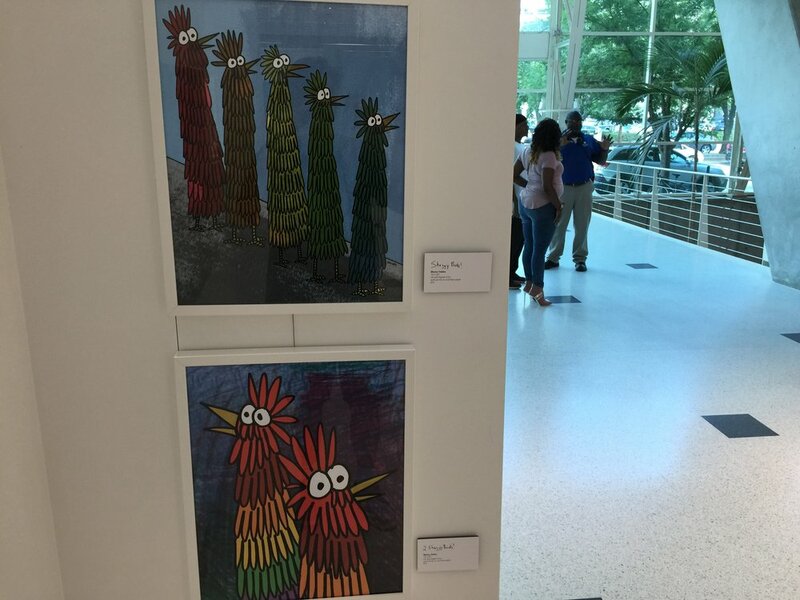 I had a three month show at the main branch of The Richland Library in their beautiful newly renovated space. This marked the end of my 1 year residency there and it was a wonderful experience. I illustrated and designed this for the Richland Library Bookmark Art Project. It was another fun year at Crafty Feast. This year we went small with only mini canvases and original drawings. As always, we had a great time meeting people and slinging art. I had a great time meeting tons of people and selling lots of art this year at the always well-run Crafty Feast. The people have spoken and the little canvases are a hit! Thanks to everyone who stopped by to say hello and take home some original art. E-mail me for open studio times starting now! Story time in the Children’s Room with drawing activity after. 1st 50 kids will receive a free Secret Species figure. E-Mail me with any other questions. I will reopen my Etsy store on December 13.